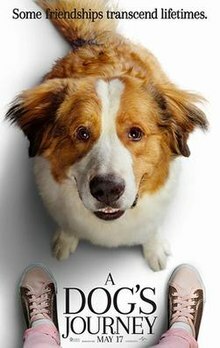 A Dog's Journey is an upcoming 2019 American comedy-drama film directed by Gail Mancuso and written by W. Bruce Cameron, Cathryn Michon, Maya Forbes, and Wally Wolodarsky. The film is based on the 2012 novel of the same name by W. Bruce Cameron and a sequel to the 2017 film A Dog's Purpose. The film stars Josh Gad, Dennis Quaid, Marg Helgenberger, Betty Gilpin, Kathryn Prescott and Henry Lau. The film is a co-production between Amblin Entertainment, Reliance Entertainment, Walden Media and Alibaba Pictures. It will be released by Universal Pictures in the US on May 17, 2019. Set after the events of the first film, Bailey the dog lives his happy life on the Michigan farm of his "boy" Ethan, his wife Hannah, and their granddaughter Calista Jane "CJ". The problem is that CJ's troublesome mom decides to take and steal CJ away. As Bailey's soul prepares to leave this life for a new one, he makes a promise to Ethan to find CJ and protect CJ at any cost. Thus begins Bailey's adventure through multiple lives filled with love, friendship and devotion as he, CJ, and CJ's best friend Trent experience joy and heartbreak, music and laughter, and few really good belly rubs. Josh Gad as the voice of Bailey, Molly, Max and Toby, Ethan's dog. Dennis Quaid as Ethan Montgomery, Hannah's husband and Bailey's owner. Marg Helgenberger as Hannah Montgomery, Ethan's wife. Betty Gilpin as Gloria, Hannah's daughter-in-law and CJ's neglectful and abusive mother. Kathryn Prescott as Calista Jane "CJ", Gloria's daughter and Hannah's granddaughter. Henry Lau as Trent, CJ's love interest. On June 21, 2017, CEO of Amblin Entertainment Michael Wright announced that a sequel to the film A Dog's Purpose was in development. On August 26, 2018, Universal Pictures began production on the sequel, which will be directed by Gail Mancuso, and scheduled for release on May 17, 2019. In addition to Quaid and Gad reprising their roles, the cast will also include Marg Helgenberger, Betty Gilpin, Kathryn Prescott and Henry Lau. Principal photography began in August 2018. The film will be released by Universal Pictures on May 17, 2019. ^ "Mark Isham Scoring Gail Mancuso's 'A Dog's Journey' - Film Music Reporter". filmmusicreporter.com. Retrieved 2019-03-27. ^ 毕楠. "Alibaba, Amblin start filming 'A Dog's Journey' - Chinadaily.com.cn". www.chinadaily.com.cn. Retrieved 2019-02-09. ^ "A Dog's Journey | Silver Screen Insider". silverscreeninsider.com. Retrieved 2019-02-09. ^ "A Dog's Purpose Sequel is Happening Because Of China". slashfilm.com. 21 June 2017. ^ "A Dog's Journey (2019) - Box Office Mojo". boxofficemojo.com. Retrieved January 12, 2019. ^ "Betty Gilpin Joins Dennis Quaid, Josh Gad in 'A Dog's Purpose' Follow-Up (Exclusive)". Hollywoodreporter.com. 26 August 2018. ^ McNary, Dave; McNary, Dave (2018-08-27). "'A Dog's Journey' Adds China Interest With Henry Lau, Marg Helgenberger, Betty Gilpin". Variety. Retrieved 2019-02-09.